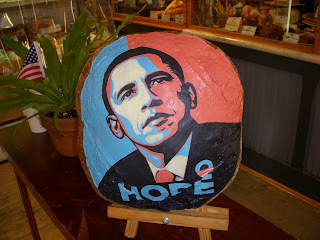 Photo - Loaf of Bread at Metropolitan Bakery 19th & Spruce Streets Rittenhouse Square as created by artist Lori. What a week this has been! An extraordinary turn of events for our country bringing genuine hope and excitement to so many of us. Like many people around the USA, I spent Tuesday connected to every media outlet that I could, watching, listening and reading about every moment of the inauguration and President Obama's first 24 hours as Number 44. I've had more mist in my eyes and the fullest feeling of pride in my heart than I can ever remember. This is the first week in over eight years when I have felt so happy to be living in America and to have been one small point of light in our Nation's collective glow. Slogging through the darkest days towards spring it's nice to know the days are literally growing longer, allowing us more hours of daylight to bring us out of the they grey doom. More day light light (and the new president) makes me feel more energized! Too bad it's been too cold for much if any outdoor activity. I've not ridden my road bike in a few weeks, not since that last ride with Susan Hill when my toes became encased in ice cubes for several hours. The one day this week when the temperatures were above 40 degrees, I had to work late and couldn't get out to enjoy the mid-winter one-day thaw. I have however been visiting with friends, old and new; seeing a lot of movies, good, mediocre and outstanding, and cooking some marvelous dishes. In the past week I caught up with someone from my past - 20 plus years in the past, which brought about an unlocking of a time capsule of long forgotten memories and embarrassments. At what point does one's memory cease to matter and past events cease to cause you discomfort? For some of us, memories falter and fade and for others memories retain their crystal-edge pointed sharpness, cutting through the intervening years with a swift deft precision. I'm not sure that there are events or things that I've done or that have happened to me that I will ever be able to shake out of my system. Try as I'd like to forget, you just cannot escape the past. At my therapy appointment this past week, I had the chance to review sessions from a year ago, allowing me to see what progress I've made over the past year in my personal well-being. Aside from the obvious physical transformations, having lost an addition 26 to 30 pounds since January 2008, I was reminded of some great emotional break-throughs I made. I felt genuinely proud of my personal commitment that I've made to be more open and willing to talk about my horrendous childhood; to be willing to take steps to move forward and be more open in my every day life. I also was able to see how connected my physical activity is to keeping me on an even emotional level. This is the first winter in years when I have not fallen into my deep dark seasonal affective disorder. Going to the gym and working out definitely keeps me alive and full of vigor. The yoga classes I've been taking have helped me find an inner calm I didn't know could exist. Along with the continued therapy, working out, attending Weight Watchers, there are also my good friends who help keep me grounded. I often write about the Susan's, and our biking adventures, but there are some other fantastic people who I had the chance to see this past week. Dana, Cheryl and Mingo. When so many of our moved away over the past few years, Liz and I went through a period of not having too many Philly friends. Luckily we were able to grow closer and our relationship became stronger. People come and go but our friends are always in our hearts even if they live many states away. We saw The Wrestler on Monday afternoon and got to catch up with our friend, Dana. Hanging out with Dana was great fun. We saw an amazing movie and then went to Jones for dinner. While the time together was great and The Wrestler is by far the best movie of 2008, it's a difficult movie to watch. There are some bone-crushing scenes and soul-rocking performances. Mickey Rourke deserves to win an Oscar for his real, brutal and touching performance as a man trying to relive the high point of his broken life. This movie is like an unvarnished and heart-breaking real life version of Rocky, without the pretty Hollywood ending. Also this past week, I saw Doubt - which was good, but it seemed to suffer from having been a staged drama play and couldn't quite make the leap onto the big screen as a full blown drama in multi-dimensions. Both Sue S. and I thought there were times with the actors didn't quite stay in character, doing and saying things that didn't make sense with where their personalities were dictating. I also saw Last Chance Harvey - a silly sentimental sap fest that was a decent diversion to fill a cold evening. Lastly, I have my cooking to keep me sane and well-fed. I volunteered to stay and help cook a Shabbat Dinner at the synagogue this past Friday night. We, the past president, Marianne, Rachel, a volunteer helper and I, cooked for about 40 people. We made baked tiliapia, rice, broccoli, salad, hors d'oeuvres, and my vegan Hoppin' John. I'm on a real chili, beans and rice and Hopping John kick lately. I feel happy to share my cooking skills and grateful that I have a job where I can be and do more than just be the bookkeeper. While this past week has been one of cautious optimism, there has also been more bad economic news, it just keeps hitting closer to home. I learned of several layoffs of close co-workers and associates from other jobs. If offering my services as a cook will help me to keep a job that I love, than baby you can be sure I'll be cooking and bookkeeping for the rest of my life! Where else could I possibly work that gives me so many freedoms and joys and allows me to utilize many of my skills? I'm sure there are places, but in this economy I'm not sure where that next ideal job may be for me. I went from cooking at work to cooking at home, utilizing my free Sunday to make at least half a week's worth of lunches and dinners for Liz and me. Which not only translates into healthy meals for us, but also some healthy blog recipes too! 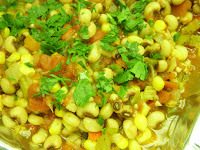 Stay tuned for my next post - a recipe for curried split pea soup.